Egyptian GDP was $235.4 billion in 2017. It’s economy is the second largest in Africa and one of the largest and most diversified in the Middle East. U.S. exports to Egypt in 2018 totaled $5 billion. 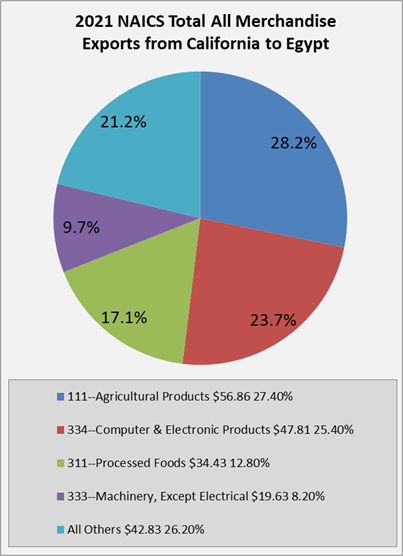 32% of the total constituted $1.6 billion worth of agricultural products, while 12% and 8.6% represented $605 million of chemicals and $436 million of transportation equipment, respectively. The U.S.’s imports from Egypt were $2.48 billion, 33.8% of which was made up by apparel manufacturing products which totaled $837 million. This was followed by oil and gas and petroleum and coal products which made 18.5% and 14.7% of the total.(U.S. Department of Commerce). California exports to Egypt totaled $197 million in 2018. Transportation equipment made up $54million and 27.6% of the total, followed by agricultural products with $44.9 million and 22.8% of the total. Computer and electronic products also made up 14% and $27.5 million. Imports from Egypt to California totaled $159 million in 2018. 72.2% of which was apparel manufacturing products which totaled $115 million. The next largest was textile mill products making up 6.2% of the total and $9.8 million.(U.S. Department of Commerce).